1. Bring a large pan of salted water to the boil and cook the tagliatelle for 2 minutes. Add the peas, return to the boil and cook for another 2 minutes, until the pasta is al dente and the peas are tender; drain well, reserving a cupful of the cooking liquid. Meanwhile, use a vegetable peeler to shave the courgettes into ribbons and finely dice the leftover cores. 2. Return the pasta, peas and 2-3 tbsp cooking liquid to the pan, stirring through ½ the pesto, until well coated. 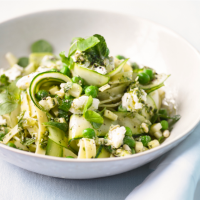 Stir the courgette through the pasta with most of the pea shoots and mint; season. 3. Divide between plates, topping each with crumbled ricotta and the remaining pesto, pea shoots and mint. Finish with a good grinding of black pepper before serving. Courgettes are a great source of folate and vitamin C, both of which help to keep your immune system healthy. Made from whey instead of curd, ricotta is lower in fat than other cheeses. Its mild flavour means it's ideal with soft herbs and lemon zest. This recipe was first published in Fri May 01 14:18:00 BST 2015.